The Riigikogu passed the Act on Amendments to the Employment Contracts Act and Other Acts (356 SE), initiated by the Government, which updates the working conditions for minors through allowing for more flexible employment relationships. The Act also amends the restrictions concerning the working time of minors, daily rest time, work which may be done by minors, and the rules for the application for permission from the Labour Inspectorate for working as a minor. In the case of minors subject to compulsory schooling, in the future, working time during a quarter of an academic year and working time during a school holiday will be differentiated, and the permitted duration of such working time will be determined. In the case of minors subject to compulsory schooling, in the future, working time during a quarter of an academic year and working time during a school holiday will be differentiated which is not provided for in the current Act. Working time during a quarter of an academic year will be brought into conformity with an EU directive. Therefore, compared to the current law, the working time during a quarter of an academic year will be restricted to 2 hours a day and 12 hours a week for minors subject to compulsory schooling. Under the current Act, a minor subject to compulsory schooling may work for 3-4 hours a day and 15-20 hours a week, depending on his or her age. The Act that was passed allows to work significantly more during school holidays. For example, a 13-14-year-old or older minor subject to compulsory schooling will be allowed to work for up to 7 hours a day and 35 hours a week instead of the 4 hours a day and 20 hours a week provided for in the current Act. However, in the case of a minor subject to compulsory schooling, the prohibition to work for more than a half of a school holiday will remain in force. A 7-12-year-old minor can still work for 3 hours a day and 15 hours a week during school holidays. The Act eliminates the specification for the working time of a 5-17-year-old minor not subject to compulsory schooling which enables to require a minor to work for 8 hours a day and 40 hours a week similarly to adults. The Act eliminates the types of work which may be done by 13-16-year-old minors established by a regulation of the Government of the Republic. This amendment expands the possibility for minors to engage in various jobs and, in the future, an employment contract may be entered into with minors of that age for performing any light work suitable for their age and abilities. The Act makes technical amendments to the Trade Unions Act, the Collective Agreements Act, the Employees’ Trustee Act, the Community-scale Involvement of Employees Act and the Occupational Health and Safety Act. Links are created with the Law Enforcement Act as regards supervision and application of special measures. Also, the upper limit for penalty payment provided for in in the Community-scale Involvement of Employees Act and the Occupational Health and Safety Act (3200 euro) is brought into conformity with the upper limit for penalty payment provided for in the Law Enforcement Act (9600 euro). According to the Act, upon hiring minors, consent from the labour inspector will be presumed instead of the prior written consent that is required at present. According to the procedure provided for by the Act, the employer enters an employee who is a minor to the employment register ten working days before the date of commencement of employment by the minor. The employer adds information on the consent of the legal representative of the minor to commencement of employment by the minor, the conditions under which the child commences work, where the work is performed and what the duties are, and whether the child is subject to compulsory schooling. Kalvi Kõva took the floor during the debate. 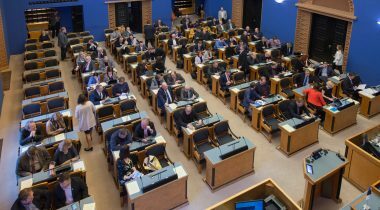 79 members of the Riigikogu voted in favour of the passing of the Act. There was one abstention. The Act on Amendments to the Liquid Fuel Act (361 SE), initiated by the Government, provides for the bases and procedure for handling liquid fuel, the requirements for allowing the use of biofuel used in transport, the arrangements for state supervision and the liability for violations of this Act, with a view to ensuring the payment of taxes and guaranteeing the quality of the more widely used motor fuels. The Act transposes the EU’s obligation according to which by 2020, fuel produced from renewable sources, that is, biofuel, must account for 10 % of the total fuel energy in transport fuels consumed in Member States. The explanatory memorandum notes that, as at 2015, the share of fuel from renewable sources, mainly green electricity, accounted for 0.2 per cent in transport in Estonia. According to the Act, as of May next year, sellers of fuel will have the obligation to sell fuel containing biofuel to the extent of at least 3.1 percent of energy potential. The obligation to add biofuel will not be applied to winter diesel fuel from November 2018 to the end of March 2019. Starting from April 2019, the amount of bioadditive in fuel released for consumption will have to be 6.4 per cent. By the beginning of 2020, this level will have to be at least 10 per cent and not less than 6.4 per cent in the total energy in every litre of fuel released for consumption. Aivar Kokk took the floor during the debate. 74 members of the Riigikogu voted in favour of the passage of the Act and 7 voted against. The Act on Amendments to the Youth Work Act, the Private Schools Act and the Hobby Schools Act (341 SE), initiated by the Government, increases the opportunities for 7–19-year-old young people to acquire knowledge, skills and attitudes in at least the following areas: culture, sports, and natural and exact sciences and technology. The state will pay a subsidy to improve the availability and diversity of systemic and guided hobby education and hobby activities. The Act provides that the state will begin to additionally support hobby education and hobby activities from 1 July this year. The number of young people and the number of young people with disabilities and the number of young people aged 7–19 who live in families who have difficulties in subsistence will be taken as a basis when calculating the amount of the additional funds allocated to rural municipalities and cities. The financial capability of the local government, and the regional availability of hobby education and hobby activities will also be assessed. According to the Act, the budget funds intended for hobby education and hobby activities will be distributed as follows: 50 per cent of the money will be assigned for ensuring availability, and 50 per cent for ensuring diversity. According to the data of the Ministry of Finance, this distribution will ensure opportunities to participate in hobby education and hobby activities for at least 40 000 young people aged 7–19 who are in a difficult socio-economic situation. It would also help improve regional availability of hobby activities in regions with a small number of residents. Toomas Jürgenstein, Märt Sults, Laine Randjärv and Krista Aru took the floor during the debate. 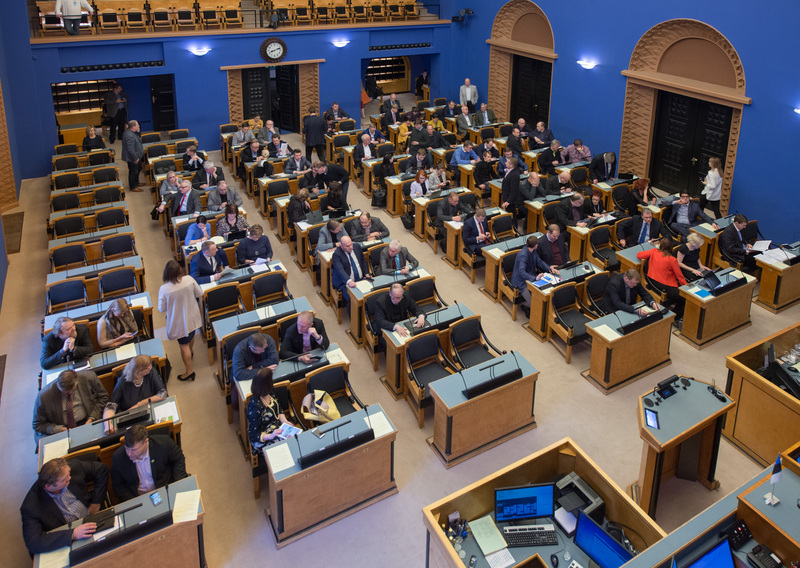 79 members of the Riigikogu voted in favour of the passing of the Act. The Public Procurement Bill (204 SE), initiated by the Government, will increase the flexibility of the conduct of public procurements, reduce the costs of procurement procedure, and transpose three European Union directives. The Bill provides for raising the thresholds for public procurements which will allow for simplified procurement procedures to be used more extensively. The Bill will also create preconditions for small and medium-sized enterprises to have better access to procurements, because it will restrict the right of the contracting authority or entity to require a large economic turnover for participation in a competition, and will obligate the contracting authority or entity to give additional reasons as to why they do not wish to divide up a large procurement. On the basis of the proposals of stakeholders, the simplified procurement threshold will be raised from 20 000 euro to 30 000 euro in the case of supplies and services, and the public procurement threshold for works will be lowered from 300 000 euro to 150 000 euro. The amendments are necessary to ensure in the Estonian public procurement landscape a reasonable balance between the administrative and workload of persons and authorities participating in public procurement procedure, and the general principles of public procurement, particularly equal treatment, transparency and the exercise of control. National thresholds for social and specific services will be provided for. According to the Bill, the contracting body will conduct a specific procedure for social and specific services in the case when the estimated value of the social and specific services is equal to or greater than 750 000 euro, which is the international threshold provided for in a directive. In the case of contracts for social and specific services with a value equal to or greater than 60 000 euro, according to the Bill, the contracting body will send a contract award notice after the conclusion of the contract. The raising of the international threshold in the directive as compared to the current threshold (207 000 euro) is due to the fact that, because of the specificities of these services, they are of no or little cross-border interest. A similar logic cannot however be applied in view of the national regulation as competition is present in these sectors (particularly in the case of specific services) nationally. It is ungrounded to exclude from regulation nearly 80 per cent of public procurements in these sectors. The establishment of national thresholds is important to ensure competition and to ensure the possibility to challenge unlawful decisions of contracting bodies, insofar as publishing of the public procurement in the procurement register and application of a standstill period before the conclusion of the contract are basic elements of the specific procedure for social and specific services. The Bill provides for a new type of procurement procedure – innovation partnership, which can be used for the development and subsequent purchase of an innovative product, service or works not yet on the market. The amendments also provide that, in the future, small-scale (10 per cent of the initial value of the supply and service contract or 15 per cent of the initial value of the works contract) changes to a public contract will be allowed without additional obligation to give reasons. The Bill will create the bases for transition to paper-free organisation of e-public procurements. The obligation of full transition to e-public procurements will enter into force on 18 October 2018. During the transitional period, contracting bodies can adapt themselves to the new provisions and make the information technology developments necessary for a smooth transition. Arto Aas, Erki Savisaar, Krista Aru, Urmas Kruuse and Aivar Kokk took the floor during the debate. The Bill on Amendments to the Commercial Code and Amendments to Other Associated Acts (384 SE), initiated by the Government, provides that it will be possible to examine data and file documents in court registers and to make print-outs of them in notaries’ offices or via a corresponding website. The Chamber of Notaries will have to ensure the possibility to examine business and public files in one notary’s office in Harju, Tartu, Pärnu and Ida-Viru counties. Servicing of people at the offices of the land registry departments and registration departments of Tartu County Court will be terminated, and they will be encouraged to use e-service. It will still be possible for persons to see data and documents of companies, non-profit associations or foundations relating to them in the information system of the commercial register. At the same time, every registry card of a company, non-profit association or foundation in which all data entered into the commercial register or the non-profit associations and foundations register are visible is available free of charge. In the case of the land register, the owner of an immovable will also see data and documents relating to him or her free of charge. The explanatory memorandum notes that, according to statistics, already now e-services are used approximately ten times more often than services in the office. 343 certified print-outs were applied for from the land registry department, and 2145 from the registration department in 2015. Print-outs of the registry cards of the commercial register account for the largest share. In 90 per cent of cases, legal persons applied for such print-outs in 2015. The land register, the ship registry, the marital property register, the commercial register, the non-profit associations and foundations register and the commercial pledge register are court registers. The Bill on Amendments to the Planning Act and the Environmental Impact Assessment and Environmental Management System Act (411 SE), initiated by the Economic Affairs Committee, will enable the authorities that organise planning work to enter into a contract to cover the costs of the commissioning of the preparation of a spatial plan and impact assessment, including the strategic environmental assessment, with the party interested in the preparation of the spatial plan. The authority arranging the preparation of a spatial plan may enter into a contract for the commissioning of the preparation of the spatial plan, as well as for the covering of the costs of impact assessment, with the interested party, regarding the spatial plans that serve as the basis for the preparation of building design documentation (national designated spatial plan, local government designated spatial plan and detailed spatial plan). The authority arranging the preparation of a spatial plan may agree with the party interested in the preparation of the spatial plan that the arranging authority carries out all acts necessary for the preparation of the spatial plan – the carrying out of procurements, the planning proceedings, disclosure and approval –, but the interested party covers the costs related to the preparation of the spatial plan and impact assessment. The amendments will enable to implement development projects regardless of the financial resources of the authority that organises the planning work. The Labour Dispute Resolution Bill (407 SE), initiated by the Government, will regulate the establishment and the rules of procedure of labour dispute committees, and the procedure for the resolution of a labour dispute. The Bill will ensure simple, speedy, cheap and efficient out-of-court resolution of labour disputes. Up to now, out-of-court labour disputes have been resolved pursuant to the Individual Labour Dispute Resolution Act which has been in force since September 1996, and several deficiencies have become apparent in practice in the implementation thereof. The Bill will provide for alternative possibilities to resolve labour disputes in the form of written proceedings, conciliation procedure and compromise. The current procedure allows for hearing an application at a meeting of a labour dispute committee. By way of an exception, an application can be resolved in the absence of the parties only in the case when the parties admit each other’s claims to the full extent. There are no possibilities for conciliation procedure or compromise upon the resolution of a labour dispute. In practice, compromises are entered into, but this happens outside labour disputes, as a result of which the existence of an enforcement instrument is not ensured. According to the Bill, in the future, the chairman of a labour dispute committee can resolve alone financial claims amounting up to 6400 euro. In other cases and at the request of the parties, the matter will be resolved at a meeting by a three-member committee. The current upper limit of 10,000 euro for financial claims solved by labour dispute committees will be eliminated in the Act. At present, it is possible to have recourse only to a court if a claim exceeds 10 000 euro. The term for the hearing of a matter of labour dispute will be extended from the current 30 calendar days to 45 calendar days. The amendment arises from practice as in the last two years the average duration of reviewing labour disputes has been 36 days. For example, the organisation of out-of-office meetings influences the duration of the review of labour disputes. The explanatory memorandum notes that the Labour Inspectorate, the Estonian Employers’ Confederation, the Estonian Chamber of Commerce and Industry, the Estonian Trade Union Confederation, the Estonian Bar Association, the Estonian Lawyers’ Union and the Estonian Association of Judges have been involved in the drafting of the Bill and have approved it. On the motion of the Constitutional Committee, the Riigikogu rejected at the first reading the Bill on Supporting Local Democracy (388 SE), initiated by the Estonian Free Party Faction. It was intended to reduce the allocation of funds to political parties from the state budget by around a quarter, in order to distribute it as activity support between the candidates and lists who win seats in local government councils. The result of voting: 56 in favour, 8 against and 1 abstention. The Bill was dropped from the proceedings. The sitting ended at 5.08 p.m.